For once it is our men who take centre stage following the running of the County Novice “B” Cross Country Championships in Moyglass. An exceptional piece of running from Stephen Flanagan saw him completely dominate the men’s race to come home a clear and convincing winner and claim the title of County Novice “B” champion. No matter what the opposition did, he did better, upping the pace considerably throughout the race leaving no one in doubt of his intentions to capture this elusive title. He did so with great style and deservedly won the championship following many years of effort. While Stephen deservedly receives the accolades for this victory lest we not forget the fantastic efforts of Jody Sweeney, Richard Daly and Pakie Bowe who all put in exceptional performances in a very competitive race, each having to fight their won respective battles with the opposition, to finish 6th, 11th and 13th respectively. With a team score of 18pts it was a nervy wait for the official results to see if they could retain their title from last year but if anyone was in doubt about the tremendous competitive nature of this championship then the team results showed this with three clubs, Moyne, Dundrum and Moreabbey Milers all finishing on 18pts each, something that hasn’t happened, to my knowledge, in any competition of this nature before. Because of the even scores, the result then comes down to the finishing place of the third placed team athlete, which decides the 1,2,3 and luck didn’t favour the tremendous efforts of our athletes as they were awarded the bronze medals. A huge well done to all four athletes on a fantastic day’s competition. In the Ladies race the girls were very much up against it in retaining their title for another year but as always they all gave it their best shot. In what was yet another competitive competition little or nothing separated the complete field of athletes with Kate Harrison leading them home in an excellent 7th place. 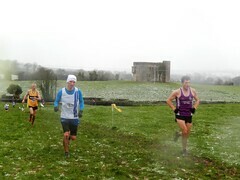 Aisling Maher came through for 9th just ahead of Sharon Kiely in 10th with Susan Fogarty 12th and Ber Spillane 14th. The Girls once again got amongst the team medals combining to finish 3rd in the team competition. Well done ladies on a great achievement. From a club point of view it was once again great to see the honest effort from all the men and ladies and the great team spirit amongst the athletes is certainly shining through and long may it continue into the future.